Earlier in April Professor Haifa Takruri MBE, Director of the JMEE (Joint MsC Electrical Engineering) programme, organised a special industry event which presented the project’s progress to date. The workshop entitled ‘JMEE: Enhancing the Participation of Industry in Research Projects in Telecommunications and Energy Sectors’ covered the processes involved in developing the JMEE programme, as well as knowledge sharing, academia-industry collaboration and EU and Palestine cultural exchange. A fantastic example of industry collaboration in action, the event was attended by a number of high-profile engineering partners. Mr Nigel Platt, System Engineering Manager at Siemens Energy, presented about AC and HVDC interconnections for offshore wind farms, from the platform installation to the energy transfer to land. Nigel answered audience questions about wind farm designs, voltage transfer and average output yield on the farms. 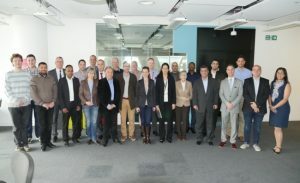 Professor Andy Sutton, Principal Network Architecture at BT and a visiting Professor in CSE, presented state-of-the-art research and standards development in 5G telecommunications technology, demonstrating how future IMT technology development is shaping the strategies for 2020 and beyond. Dr Sam Grogan, Pro-Vice Chancellor Students Experience, brought the discussion back to student experience by speaking about the work the University is doing both locally and internationally in developing the entrepreneurial skills of students. The talks were followed by an intense and technical discussion showing the vast experience and understanding of the sector by the speakers and participants. After lunch the JMEE team visited Siemens Ardwick railway maintenance facilities. Delegates got to see the new electric train and diesel train maintenance methodology. The group gained an understanding into the capacity and operation required to ensure commuter services are sustained in the Manchester region. La st week, the University Alliance joined up with the British Academy and Salford University to host an event exploring international research. Professor Gerry Kelleher Pro Vice-Chancellor for Research and Enterprise and Alun Evans Chief Executive of the British Academy launched proceedings at the University of Salford’s Media City campus. Over 100 researchers and senior academics from the across the region where invited to attend the day-long event which included presentations from Salford academics Professor Ralph Darlington and Dr Samantha Newbery. The event highlighted British Academy funding opportunities, explored policy and structural issues around international research and shared best practice and was accompanied by a supporting exhibition of delegate research. The British Academy is the UK’s national body for the humanities and social sciences – the study of peoples, cultures and societies, past, present and future. The second meeting of the Fuel Poverty Research Network (FPRN) is being held on 1st November. It is hosted by the Sustainable Housing and Urban Studies Unit (SHUSU), University of Salford on the University’s campus. The event will incorporate the autumn meeting of the Association of Local Energy Officers North West and include a presentation on their activities. With the theme ‘Fuel Poverty: Telling the Story’ this interactive session will look at creative ways of understanding and sharing experiences of fuel poverty and learning from some inspiring projects from Greater Manchester and beyond. It is an opportunity to learn about new and creative ways of communicating research and maximising impact, and to be part of a growing network working on this important issue. The day runs from 10am to 4:30pm and has presentations in the morning followed by an interactive session in the afternoon.